Ukraine vows more 'counter-terrorism' operations in Donetsk after mutilated bodies found; US pledges support, warns Russia. Ukrainian acting Prime Minister Alexander Turchinov announced renewed efforts to perform "counter-terrorism" operations against pro-Russian demonstrators Wednesday - after two bodies were found bearing signs of torture, allegedly by the demonstrators. 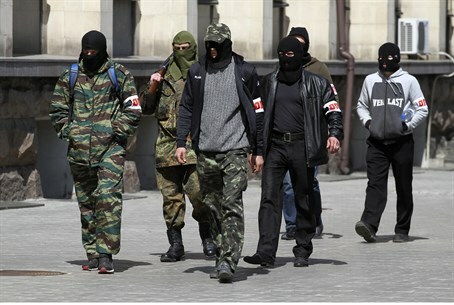 The bodies were found near the beleaguered city of Slaviansk Tuesday; one of them has been confirmed as Vladimir Rybak, a local parliamentarian. Turchinov vowed to fight the perpetrators on Wednesday, and bring the men responsible to justice. “The terrorists who effectively took the whole Donetsk region hostage have now gone too far, by starting to torture and murder Ukrainian patriots,” he stated. But Vyacheslav Ponomaryov, the de facto mayor of Slaviansk, told CNN Wednesday that the war has also become a matter of perspectives. Ponomaryov placed blame for the deaths squarely on far-right Ukrainian nationalist extremists - and insisted that the demonstrators are being framed. The US continues to back Ukraine throughout the conflict, which has snowballed since the controversial annexation of the Crimean peninsula last month. On Wednesday, the US announced that it would be sending roughly 600 paratroopers into Poland - as a "message" to Russia that the US would support Ukraine or other neighboring countries against Moscow - in the event of an armed conflict. “I can announce today that a company-size contingent of paratroopers from the U.S. Army Europe's 173rd Infantry Brigade Combat Team airborne, which is based in Vicenza, Italy, will arrive in Poland tomorrow to begin exercises with Polish troops,” Rear Admiral John Kirby, a Pentagon spokesman, told reporters at his daily briefing. Kirby stated that as part of the project, Poland, Estonia, Latvia and Lithuania will each get 150 American troops. The full deployment will be completed “by the end of this weekend, maybe Monday,” he said. “The message is to the people of Poland and Lithuania, Latvia, Estonia that the United States takes seriously our obligations under Article 5 of the NATO alliance even though these aren't NATO exercises,” he said. Earlier this month, Estonia, Latvia, Lithuania, Poland and Romania turned to NATO over concerns of an impending Russian invasion. The concerns came following the de facto military occupation of Crimea, just before the referendum vote - a scenario analysts claim has repeated itself in recent weeks throughout Donetsk.